The Internet Plan © 2013 is the all encompassing Internet website design and blueprint for building or redesigning a corporate website, e-commerce website, or intranet or enterprise portal. Using our unique website methodology, our Internet consultants construct a complete Internet blueprint or plan that encompasses all the details including information architecture, governance and design. The Internet plan includes all activities and planning to begin constructing and implementing an Internet or corporate website (or intranet portal solution) including both assessment or evaluation activities (sometimes referred to as 'discovery') as well as all of the planning activities ranging from the high-level strategic plans, to the detailed tactical requisites such as the site wireframes and information architecture. 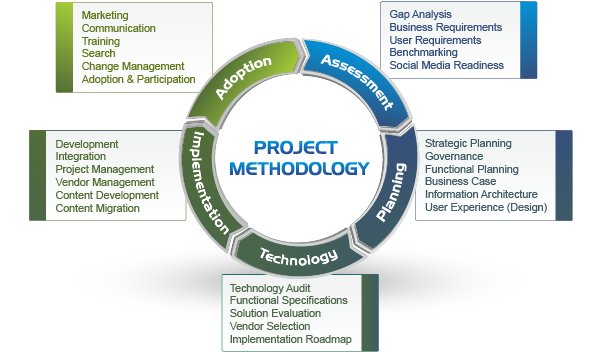 Internet Plan encompasses the first two distinct phases of our proprietary intranet project methodology: Assessment and Planning. Prescient Digital Media does not use a proprietary technology for building or constructing client websites or e-commerce sites or intranet portals. We are ‘technology neutral’ which means that we will work with you to identify the appropriate technology solution based on your business requirements, and not "who we know" or based on reselling agreements and commissions. The output of these phases constitutes the Internet Plan for guiding the implementation of the Internet or portal and the underlying governance and technology foundation. The Internet Plan contains the map and blueprint for implementing a new intranet or enterprise portal. Finally, the Internet Plan serves as the basis for evolving your site, establishing baseline targets (e.g. user satisfaction, ROI, etc.) for measuring its ongoing and future performance, and achieving its potential and value. Prescient’s experience and knowledge of world-class websites and intranets or portals is unsurpassed by any firm in its class. Our clients include HSBC, MasterCard, Nintendo, Pepsi, Royal Bank (RBC), Toshiba, WestJet and dozens of others. Prescient owns no software or hardware; we are technology neutral. We find the best technology for our clients based on their business requirements (we do not sell or re-sell any cookie-cutter or off-the-shelf solution). Prescient has the most widely spoken roster of expert of any firm in its class with dozens of conference, seminar and webinar events across the globe every year. For more information on the Intranet Plan, please contact us directly.